The establishment of Government Rose Garden by the Department of Horticulture and Plantation Crops, at Udhagamandalam owes its genesis to the Government Flower Festival which is generally celebrated during the month of May at Government Botanical Garden. The Annual Flower show is the only famous event in the Nilgiris. The First Flower Show was organized during the year 1896, under the aegis of Nilgiris Agri – Horticulture Society. Flower show is being conducted by the Government of Tamil Nadu since 1980. The Centenary of this great event was celebrated as a Festival during May 1995. To commemorate the Centenary Flower Festival the Government Rose Garden was established at Vijayanagaram in Udhagamandalam by the then Hon’ble Chief Minister of Tamilnadu on 20.05.1995. The Government Rose Garden was established in an area of 4.40 hectares spread over five terraces. The Rose Garden is situated in the lower slopes of the Elk Hill facing the Udhagamandalam town. It is about a kilometer away from Udhagamandalam Railway Station and Bus Stand and has easy access with motorable roads from both sides. Initially, 17,256 Rose Plants of 1919 Varieties were planted. Later on in the ensuing years new varieties taking the plant population to 27,000 comprising 4000 varieties. The collection includes Floribunda, Polyantha, Miniature, Hybrid Tea and Creepers. Gradually, it is proposed to increase the number of varieties by introducing new ones from different centers in India and abroad. The garden includes major attraction such as arches, bowers, umbrellas, fountains, Nilamaadam, view points and Gazebos. The entire Rose Garden is in a steep slope. The landscape has been developed in such a way that the entire Rose Garden will be visible when one stands in the four view points of the garden. Recently, a Heritage Rose section was established exclusively with oldest varieties of Roses evincing academic interest. There are five terraces in the Garden. The first terrace situated just below the approach road, has a miniature rose gallery. The second terrace being the largest terrace is the main feature of the garden. The slope on the upper side is beautifully landscaped with green kikiyu grass, foliage and flowering plants. This terrace accommodates important and popular varieties of rose plants. The latest varieties were planted here by grouping this based on shades like Vermillion, White, Yellow, Blue, Red, Pink, Mixed, Bicolour etc., Roses were planted on either side of the terrace leaving centre part as lawn, which is the living area of the garden. There is a Nilamaadam on the second terrace from where the entire Rose Garden can be viewed. Garden structures like arches, bower, benches, rose umbrellas, rose tunnel and four viewpoints have been established in this terrace in vantage points in such a way that they blend well with the landscape. When the roses are in full bloom, tourists can spend hours in this terrace admiring the diversity and beauty of rose cultivars in different colours, shapes and sizes with pleasant fragrance. The third terrace is a small and elegantly designed terrace which ends with “Heritage section”. This looks like a bow and accommodate about 170 rose varieties of floribunda. This terrace is called as the Rainbow. The visitors can enter this terrace through the service road at northern end and also from the second terrace. The fourth terrace is a wide terrace, almost rectangular in shape. This terrace is also planted with beautiful varieties of the roses on either side and two elegant fountains steal the show. The fifth terrace is also planted with most collection of rose varieties. A visitor after visiting this Rose Garden can feel the satisfaction of having seen almost all the varieties of roses available in India in a single place. Every Year Annual Rose Show is being conducted during 2nd week of May (which is the peak season in Nilgiris) to enable the numerous tourists from India and all over the world to witness the elegance of the Rose Varieties which are in full bloom during those days. A Rose competition is also being held, so that the local public can participate and display the Rose grown by them in their homes. On an average eight lakh visitors enjoy this fabulous collection of Roses every year which has become one of the Best Rose Garden in the whole of India. 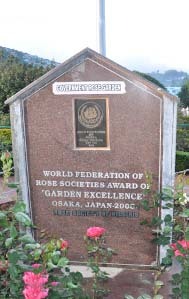 This Government Rose Garden is the only Garden in India having been awarded with ‘GARDEN EXCELLENCE’ from the World Rose Federation, Osaka, Japan during the year 2006. more about Roses..